Hello Savvy Southern Style readers, my name is Bre, and I blog over at Rooms FOR Rent, where I share my love for farmhouse decor, all things w h i t e, and dessert! I was thrilled when Kim asked me to join her and share my favorite room with all of you. Kim has a lovely home and beautiful taste, and I am honored to be here with you today. My favorite room in our house is our living room. It is our main hangout spot, the first room to be overtaken by toys and crumbs, and throw pillows on the floor, which is a good sign that it's comfortable. It was my favorite room from the start because the sunlight floods the room, and of course there's my white couch! I have loved white slip covers ever since I can remember. We got ours from IKEA about 8 years ago, despite everyone saying I was nuts, because I wouldn't want it once I had kids, one thing I learned through that, was if you know yourself well enough, and know what you like well enough, it's worth it. I know the type of personality I have, so throwing them in the washer every 6 weeks or so wasn't a big deal, to me I looked at it as getting a brand new couch every time :) And believe me we have spilt plenty of chocolate milk on them, but the best part about white, is you can bleach it, no worries. One of my favorite things to do when I'm craving some change is swapping out my curtains, and throw pillows. It provides just enough of the change I want, and when I'm ready to change again I swap things back. For now simple white linen like drapes hang, also from IKEA, to emphasize the summer sun we are about to get, keeping things light and airy. hydrangeas of any color are my favorite treat! One of my favorite features in this old farmhouse was the open concept feeling in the dining and living room. They are divided by a half wall with white columns on either side. Most recently we tackled an Ana White build, and made this printer cabinet to house all of our dvd's, and tv. I'm not quite done with the gallery wall behind it, just a few more things to hang, but I love the feel it adds to the space. Thank you so much for taking a tour of my favorite room! 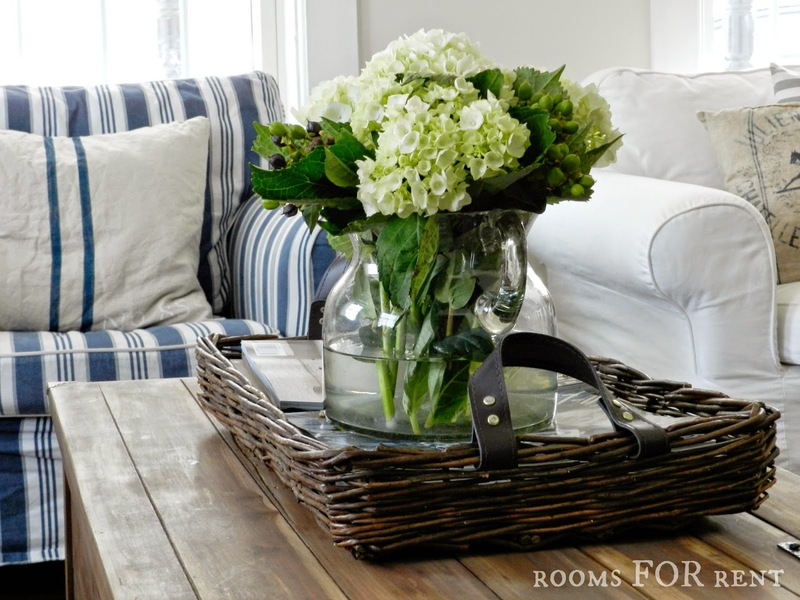 I'm so glad to be here with all of you today, and hope you enjoyed :) To see all the latest happenings, join me on Instagram (roomsforrent) where I love to show what project or space I'm working on next! Thanks so much, Bre for sharing your cute cozy favorite room with us. Okay, y'all you must pop over to Rooms For Rent and check out more of Bre's cute home. I just found Bre's blog not too long ago and just had to share. Miss any past favorite rooms? Check them all out here. I would feel completely at home in this room! 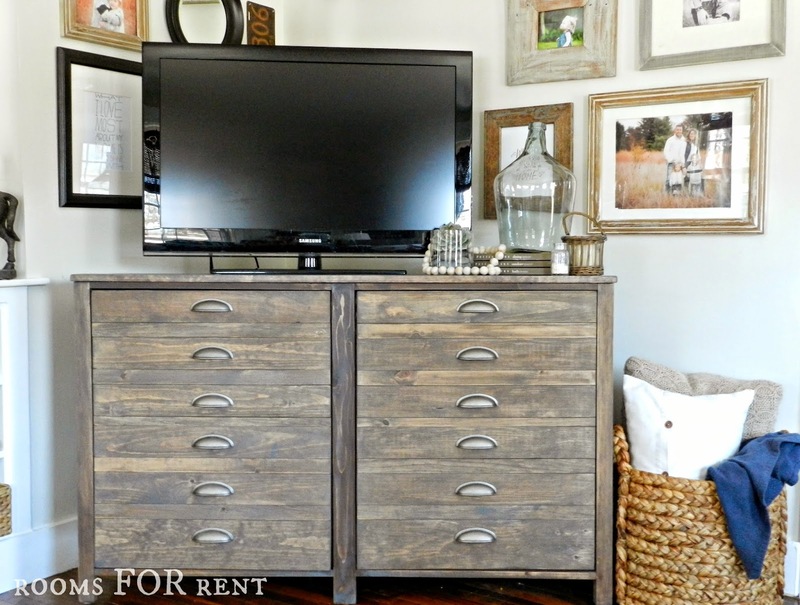 The floors are beautiful, and I love the printer cabinet holding the TV. So very charming! What a lovely welcoming room! Thanks for sharing. 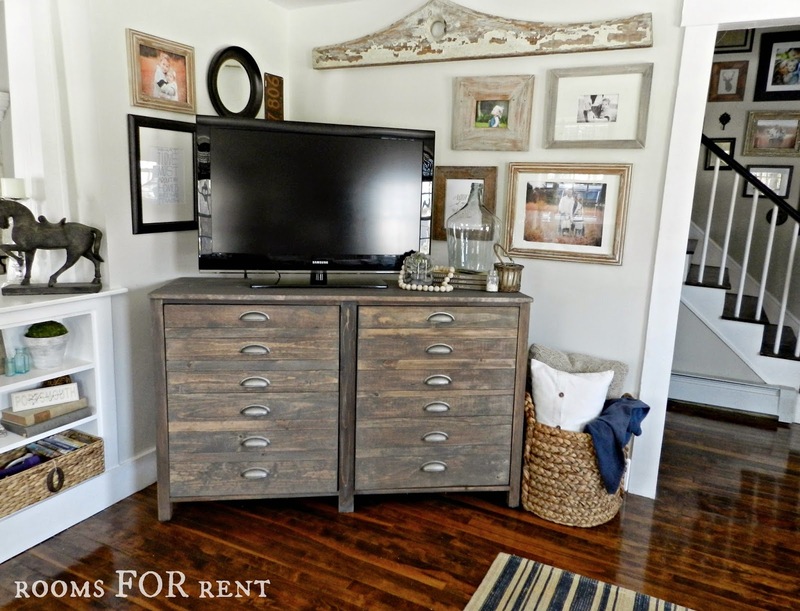 I love Bre's cozy and beautiful room...and I can say that she had me at the Ana White Build Printer's cabinet....gorgeous!...Thanks for another beautiful room today Kim...Have a great weekend Kim and Bre! 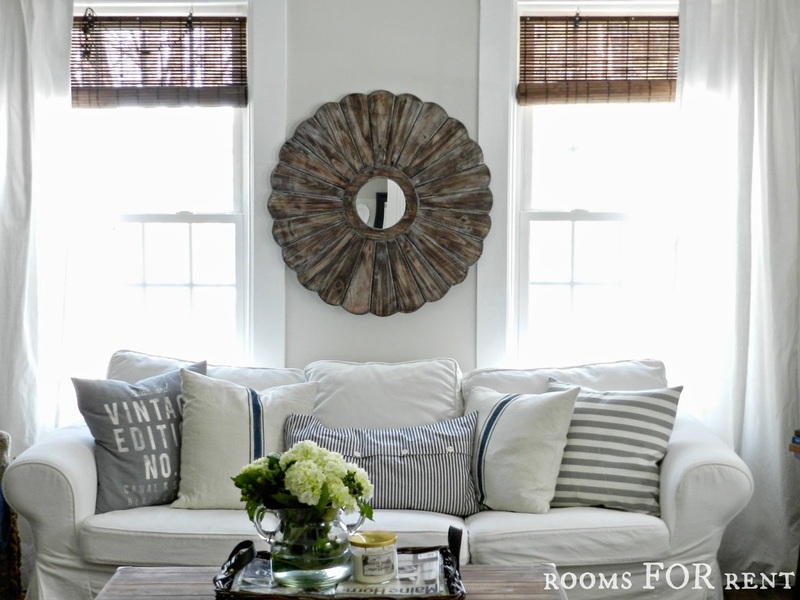 Love Bre's style...such a pretty room filled with so much eye candy!! I can easily see why this is your favorite room, Bre. It's so bright and comfy and you've added so many lovely touches. 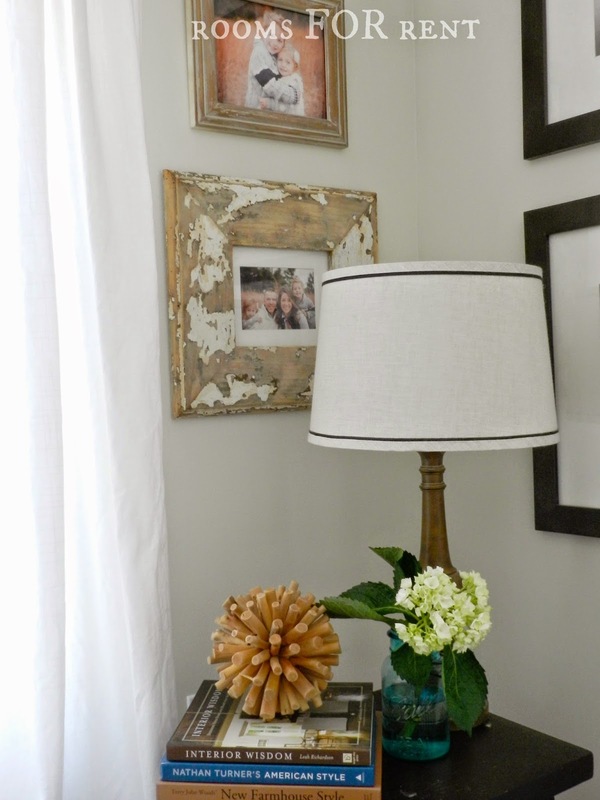 Love your gallery wall, especially the architectural piece! such a beautiful room, cosy yet sophisticated!! I love it!!! Hi Bre! So happy to find you through Kim! 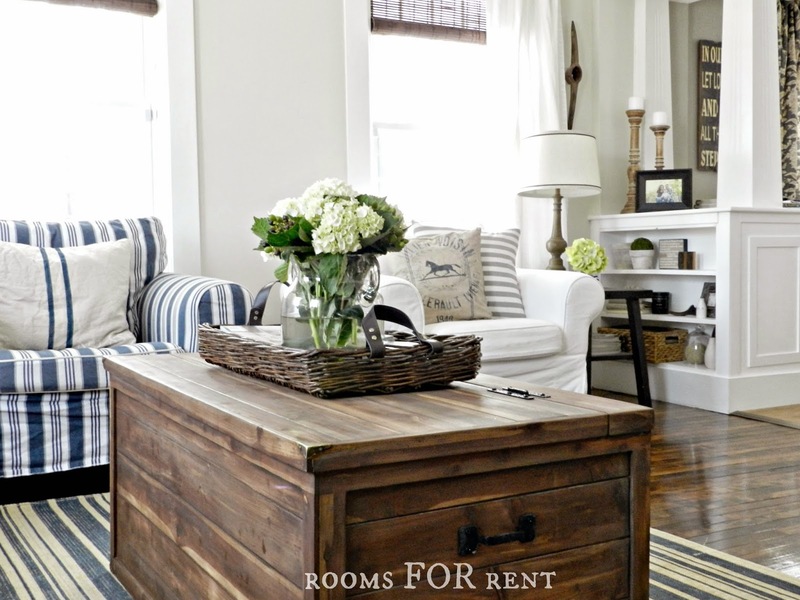 You certainly have a wonderful, comfortable and inviting Farmhouse living room! And blue and white makes me swoon! 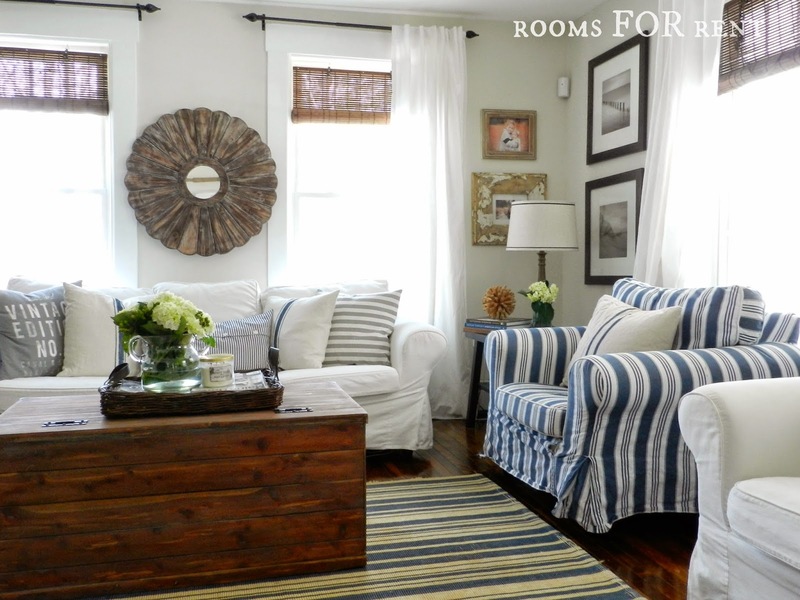 LOVE all the slipcovers and fun pillows and chippy frames. You certainly have the whole farmhouse style down. It's my favorite style too!!!! Now I'm off to visit your blog! Thanks, Kim!!! You know this is my favorite weekly series!!! What a pretty room! I love her style. I haven't seen her blog before, so now I will go take a look. Thanks for introducing her today. 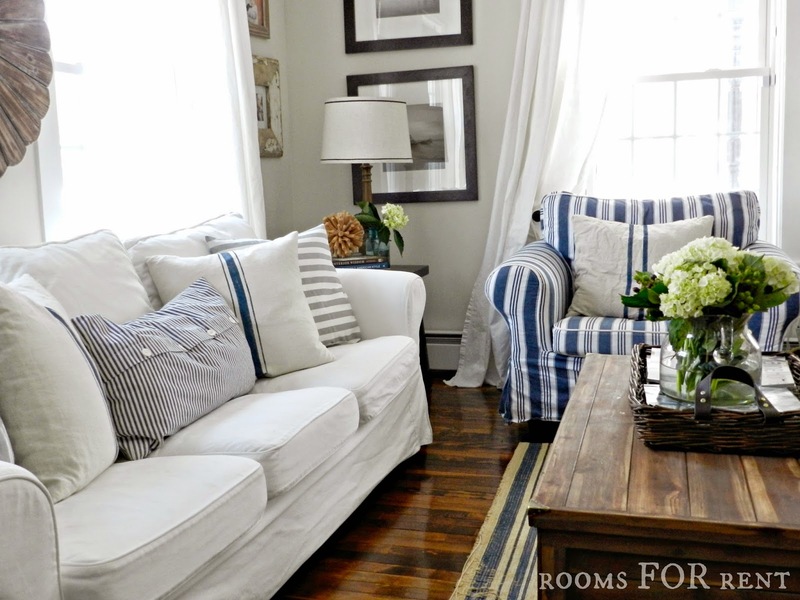 Bre's style is lovely and I agree with her about just throwing white slipcovers in the wash with some bleach. Thanks for the introduction. Linda it seems to be a feedburner issue and really no way for me to do anything about it. I hope you will follow be by bloglovin and you should get a daily feed in your email. Another luvly room Kim. 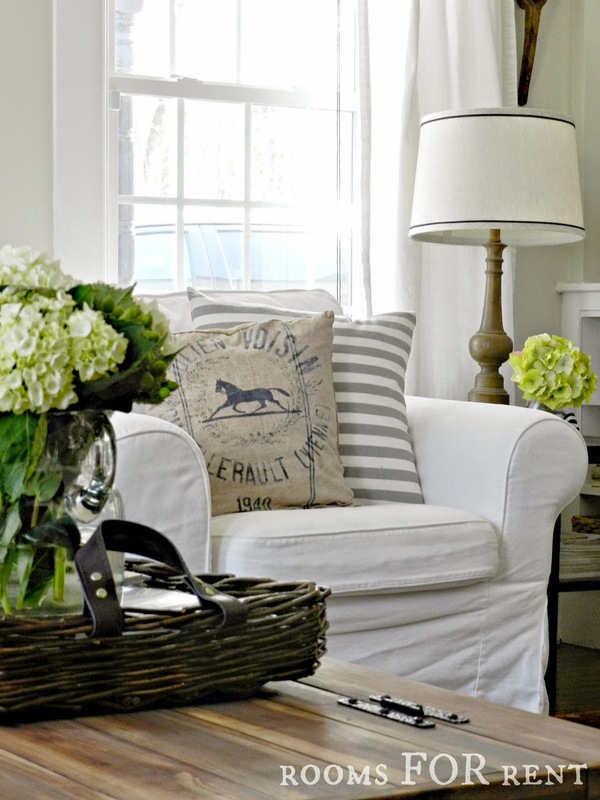 I stumbled upon Bre's blog a few weeks ago and quickly fell in luv with her relaxed style. Thanks for inviting me in for a visit ladies. I love her style...beautiful room. Great feature Kim! Now I'm off to check her blog out. Very pretty! I'm heading over to visit! What a pretty space. I used to own that same sofa. :) This is the first I have seen of Rooms for Rent....I will buzz over and say hi. What a beautiful room, Bre! I'm headed over to visit your blog. Great feature, Kim! 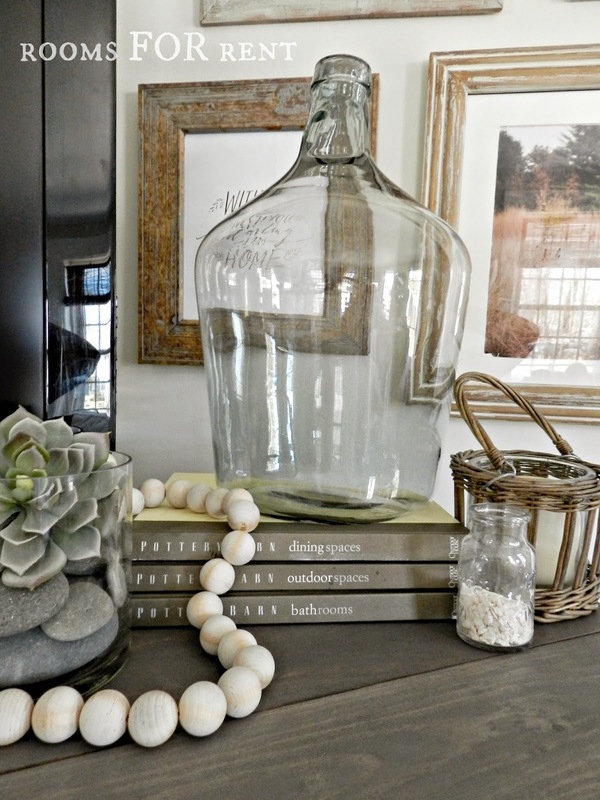 Very great and friendly looking room, I have that necklace. Glad I stopped by Kim. Makes me want to curl up with a cold drink and a good book on a hot summer's day. Thanks for giving us a tour. What a beautiful space! 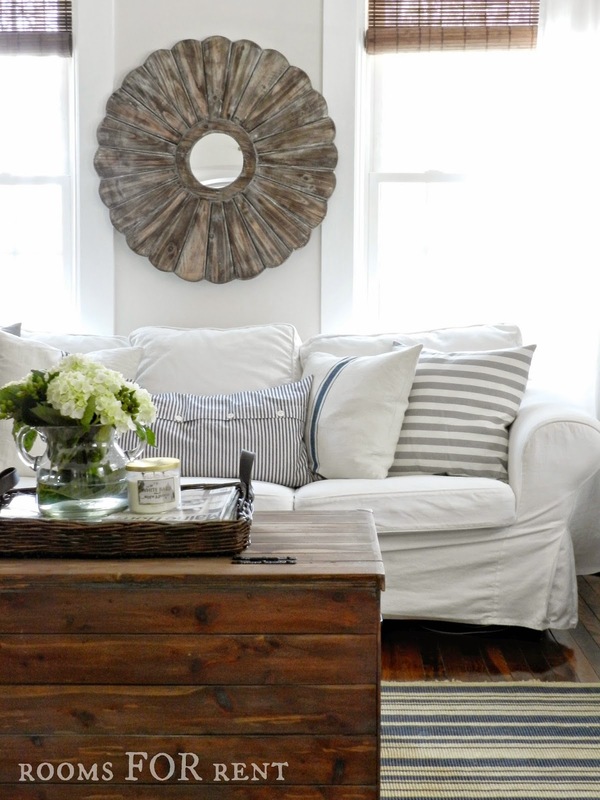 I love Bre's style and could move right into that room without changing a thing! Hi Bre!!! I sure can see why this is your favorite room, it is wonderful!!! I love the white and all of your accessories are perfect. Just wanted to give you a little tip: I am a floral designer and whenever you put fresh flowers in a vase, remove all leaves that would be in the water. They give off a gas that kills the flowers quicker. Now I will come see you at your blog too. Thanks, Kim for another beautiful room!